The Pallet Safe Cage is built to suit a standard timber pallet. It converts a standard timber pallet into a secure 4 sided meshed storage container. A simple lightweight and safe solution to materials handling, storage and transportation problems. 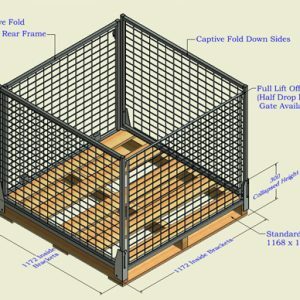 The Pallet Safe Cage was developed by JNI to satisfy the needs of a growing market requirement for a steel cage to fit securely onto a timber pallet. OH&S and worksafe issues relating to safely storing and picking products in racking systems have contributed to the innovation.